Do you have a Blackberry thumb or an iPod finger? Wrists ache from typing or mousing? 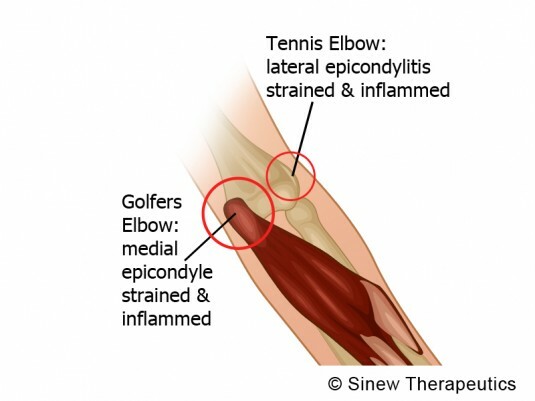 Is your elbow still swollen from the last time you played golf? If you answered yes to any of these questions, chances are you have a repetitive strain injury (RSI), also known as an “overuse injury”. RSIs result from highly repetitive movements that cause swelling and damage to the muscles, tendons, ligaments, nerves or joints. According to the U.S. Department of Labor, Occupational Safety and Health Administration (OSHA), repetitive strain injuries are the nation’s most common and costly occupational health problem, affecting hundreds of thousands of American workers, and costing more than $20 billion a year in workers compensation. Movements repeated over and over, day after day, take their toll on the body. Muscles used repeatedly stay tense and contracted, reducing the range of motion needed for activity. Micro-tears occur in the soft tissues (muscle, tendons) and the area swells up and puts pressure on nerves nearby; causing symptoms such as pain, weakness, loss of strength, and tremors. This cycle continues until the body has a chance to rest from the activity causing the tension. 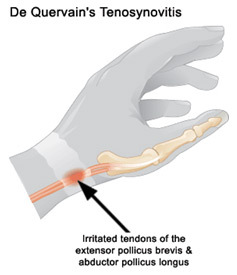 In some cases like tennis elbow, tendon healing can take a month or more. RSIs cause everyday tasks to be challenging: chopping vegetables, turning doorknobs, dressing. 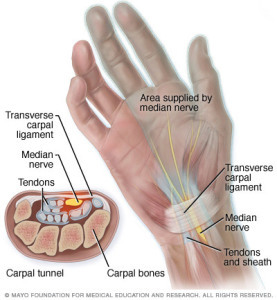 The joints that are the most affected by RSIs are in the hand, wrist, arm and shoulder. Massage therapy for a RSI will focus on all muscles involved. The injured site will be addressed of course, but the surrounding muscles need to be treated also. Your massage therapist will assess your condition by looking at your posture, range-of-motion, and muscle condition (weak, tense, spasms, etc.). With many RSIs there is internal rotation of the shoulder (turned inward) that needs to be corrected. 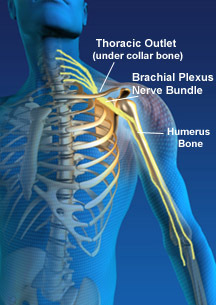 A tight shoulder will compress nerves and aggravate conditions of the elbow, wrist and hand. Circulation of blood and tissue fluid will be impaired also. Correcting the position of the shoulder helps reduce symptoms. Significant relief can be felt after one session, but several massage sessions are usually required to address the issue. Call Woodstown Massage Boutique, 856-769-1373, to schedule a massage for your RSI. ergonomic workstation – have chair with multiple adjustments (height, tilt, armrest height, etc. 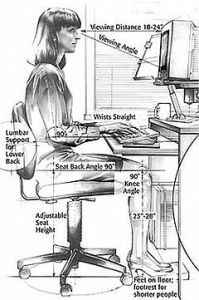 ), top of computer screenat eye level, feet on floor, headset, etc.